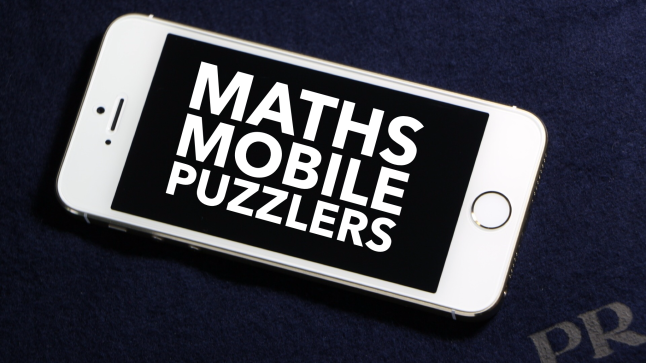 Maths Mobile Puzzlers - MathedUp! An oldie, but a really addictive game. It was once described as Tetris meets Sudoku; like Tetris you have things dropping from the sky which need slotting into the correct place; like Sudoku you need to be aware of the entire grid so you can slot the numbers into the correct place to give you maximum points (I guess it isn’t massively like Sudoku!). The idea is that discs with numbers from 1 to 7 drop down and you need to position them strategically in order to stop the grid filling up. Each time a disc drops in a slot where the number matches the number of discs in that row or column, all adjacent cells are exploded. Not massive on number work, but a fair bit of strategic thinking and problem solving required. The maths behind the scoring system is interesting if you feel the need to work it out. There are lots of modes on Drop 7 of which ‘Blitz’ is, in my opinion, the best. I am a massive fan of SET so it is no surprise that this finds itself on this list. If you are new to SET, you may want to check out this post where I describe the game in more detail. I have highlighted two versions above which have both been developed by SET Enterprises for iOS (at time of writing, there doesn’t seem to be an Android version). SET Mania has 3 different modes which are all solitaire and it is available on all iOS devices. 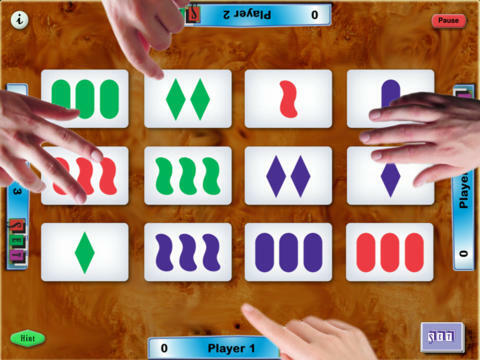 SET Pro HD works on iPad only and has 6 solitaire game modes as well as a multiplayer mode. Sprint SET is lots of fun. Check out the video below to get more of an idea on how it works. If you don’t want to download then you can still play the daily SET puzzle from the SET website. What started out as a problem solving activity in a Japanese classroom, KenKen has now grown into a puzzle enjoyed by millions. 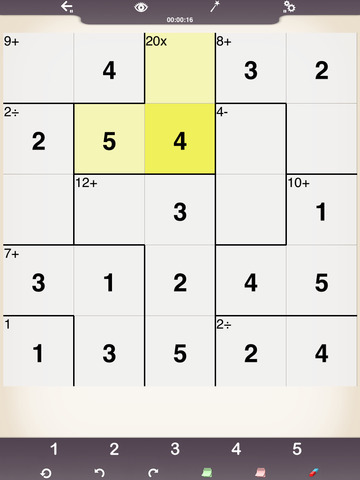 It has a regular slot in the New York Times puzzle page which highlights it’s popularity. So what is it? Simply put, it’s a grid-based numerical puzzle that uses the basic maths operations—addition, subtraction, multiplication, and division—while also challenging logic and problem-solving skills. It can also be used as a way of developing an idea of mathematical proof. It has been something I regularly use (paper-based) with my students in the classroom and they do really enjoy it and getting them to justify their reasoning before putting in numbers leads to some fantastic discussions (check out the the KenKen website to get resources). The app I had been using doesn’t seem to be available anymore since the release of this official app. I have had a quick play around with this new one and it is very impressive. The only downside is that you need to make in-app purchases once you have worked through the first 31 puzzles to get more. Highly recommended! 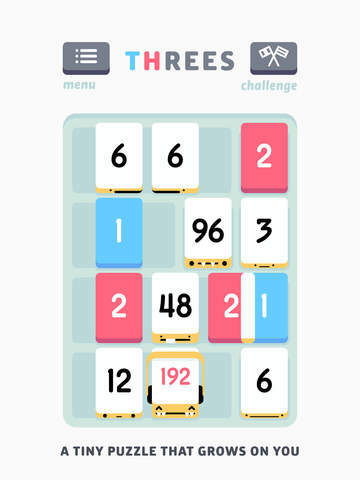 Despite the use of numbers throughout the game (and even in the title), there isn’t much numeracy involved in threes. What it does provide is a fun and engaging puzzle which requires logical and strategic thinking in order to optimise your score. The idea of the game is to match together multiples of 3, which sum to give well, er.. bigger multiples of 3. The only controls involved are swiping up/down/left/right which means you can just pick this up and start playing straight off the bat. The higher the numbers on the board at the end, the higher the score you achieve. 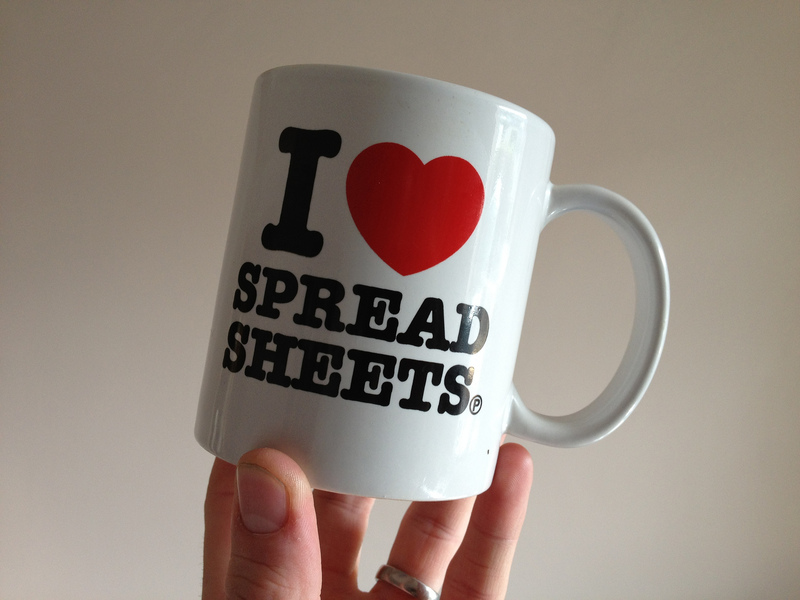 Simple idea and highly addictive! 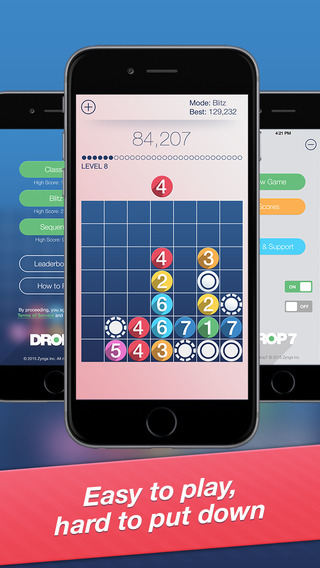 When released in early 2014, 2048 it took the world by storm and was top of the app charts for some time. 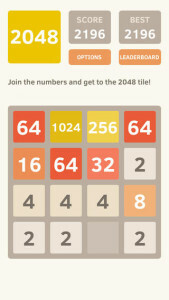 Similar to Threes!, 2048 is a swiping game in a 4×4 grid. This time you are combining powers of 2 together to make bigger powers of 2. Every time you swipe, a new number will appear in the grid until eventually you run out of moves. 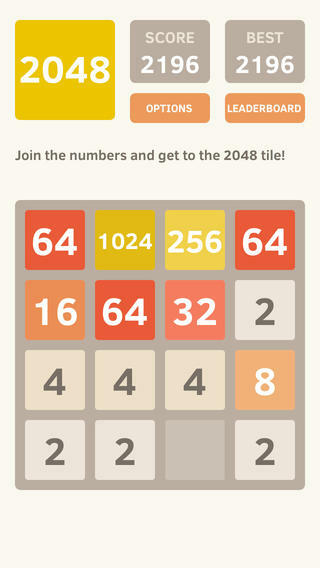 The target is to get that elusive 2048 tile before that happens. This was introduced to me recently and really is a fantastic, well thought out little game (other than the annoying “jokes” throughout). 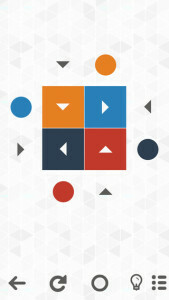 Despite what the title suggest, the game is about both squares and circles. The idea is to touch the squares to move them in the direction they are pointing in order to land on the matching coloured circles. If another square is in the way, it is pushed along. You need to plan your moves carefully in order to get all the squares onto their corresponding circles. 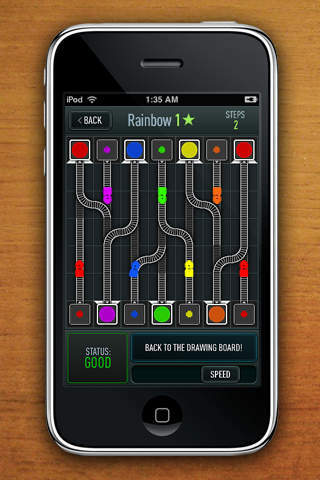 There are only 35 levels but, as you can probably imagine, the last few are fiendishly challenging! Of all the apps listed above, this is the one that develops mathematical skills in the most obvious way. If you are a teacher, get your students to download this app! If you are a parent, get your child to download this app! If you are a maths student, or anyone who wants to improve their algebra skills – download this app! Don’t be put off by the price tag – It is well worth it! As you can tell, I am a big fan of this one. It is an innovative and engaging game which starts out in a kinda ‘cute’ way with little objects which can be removed from both sides of a pit – the aim is to isolate the dragon box. Once the box is isolated, the dragon comes out and eats everything on the other side of the pit and continues to grow. As the game progresses, more rules are introduced for the player to experiment with. The pace at which this happens is spot on and before you know it, the cute little objects become letters to form expressions and you are solving complex algebraic equations. 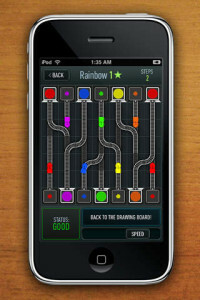 There are 350 levels including a practice mode where you can apply what you have learned to solve various equations. Finally, there is a 5+ version (iOS £3.99, Android £4.14) available for the younger ones. Inspired by Euclid’s ‘Elements’, DragonBox Elements makes it possible for players to master its essential axioms and theorems after just a couple of hours playing! 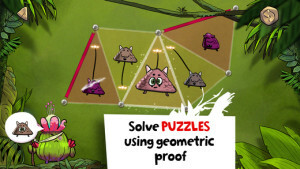 The game begins by the player identifying shapes based on their properties and as it progresses, you are introduced to new theorems and are required to use these to solve geometry puzzles. By the end, you are solving some really challenging geometry problems and will have developed an excellent understanding of the logic involved in geometrical proof. Another one I highly recommend for all! If you have any recommendations, please share using the comments box below. Also, if you haven’t done so already, make sure you subscribe below. This entry was posted in Android, apps, Blended learning, Games, iOS, iPad. Bookmark the permalink. I am pleased to see you have included apps for Android as well as iOS.